Overall winner of the competition was Darren Myners of Redruth from Richard Lander School in Truro. 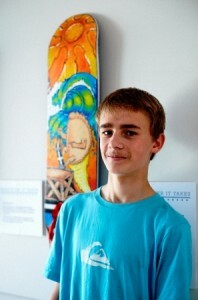 Darren impressed skateboard professional Nick Jensen – who judged the competition – and scored highly across the criteria used to assess the designs (artistic merit, originality/subject matter, spacial awareness, cultural awareness and inspiration/ability to inspire). Darren received a deck from S J Skate Store, Truro, as a prize. “The inspiration for my design is skating and surfing and also Cornish food and the history of mining. At the bottom of the skateboard are some cliffs and an engine house and chimney. 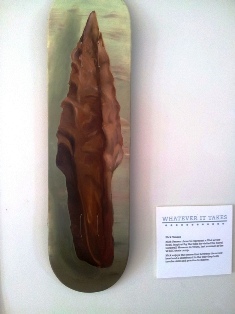 Darren’s board was on display at the Whatever It Takes exhibition at Heartlands, Pool, Cornwall in autumn 2012.